Jose Canseco was listening to a county music song on his portable cassette player. It was ninety-seven degrees on the public golf course. He took out a cigarette. 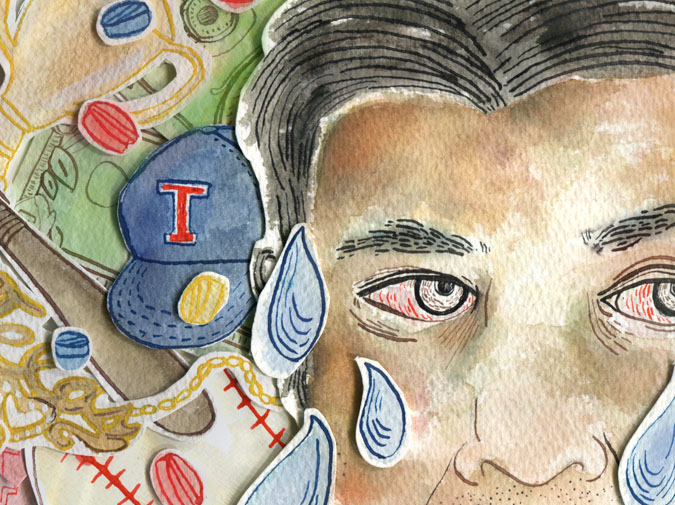 The country music song inside his portable cassette player said, “Life isn’t enough if half your life has been spent having too much.” Jose Canseco nodded and ate the entire cigarette. He smiled. Jose Canseco did not have an ordinary life. He was famous on all seven planets. His gold neck chain was too heavy. There were over three thousand trophies glued on the hood of his luxury automobile. One night, after a long evening of drugs and masturbation, he found a baby and he peed on it until his father traded him to the Texas Rangers. One of the other people on the golf course yelled at Jose Canseco for sweating too much. Jose Canseco put two fingers in his mouth and whistled. A green-and-yellow-feathered eagle flew down from god and landed on Jose Canseco’s shoulder. Everyone gently set their bags down and walked off the golf course. Jose Canseco continued sweating. His golf ball was lying in a gender-neutral puddle. The man who was paid to hold Jose Canseco’s golf clubs bent down and began to remove the puddle. Jose Canseco took off his headphones. The green-and-yellow-feathered eagle nibbled on Jose Canseco’s ear. When the bird finished eating, it turned into a cloud the size of a mouse tooth and floated away. Jose Canseco put his headphones back on. The hole where his ear used to live bled on the country music song playing from the portable cassette player. A few nights ago, Jose Canseco bought a new car and parked it in his hotel room. The other hotel guests complained because Jose Canseco was up until three a.m. beating on the new car with one of his golf clubs. The sweat was sweating more than any man had ever sweat. His heartbeats were drowning. The ear continued to bleed. He remembered he owed someone in Las Vegas eight hundred thousand dollars because he bet that the flowers on a particular tree in Taiwan would blossom on April 4th, but they had already blossomed. His headphones began to swell. The rest of the puddle got removed. The country music song was yelling at him. It said, “Your testicles used to weigh more.” He tried to block out every emotion people had ever experienced. A piece of sweat larger than his own head dripped off his left eyebrow. He walked up to the golf ball, spit on it, and weakly grounded out to the second baseman. In college, Mark Baumer was a designated hitter on the baseball team of a small liberal arts college in New England. He now works in a cubicle. Sometimes he reads an article on the internet that makes him cry. He usually goes in the bathroom and cries until he stops crying. After lunch, his stomach makes weird sounds.